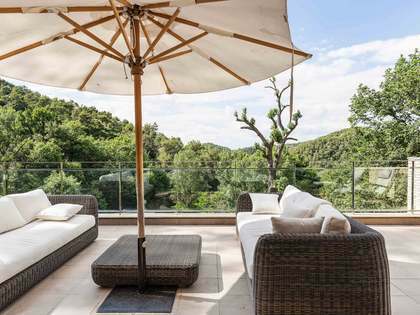 In a quiet, leafy area, just 5km from Barcelona, we find the prestigious Sant Cugat neighbourhood; a prime residential area surrounded by nature and within easy commuting distance of Barcelona city by road and rail. The town is nestled in a natural environment with the Collserola and Galliners mountain ranges offering a vast expanse of protected land to explore on foot or by bike. This privileged clean, green environment means that the inhabitants of the municipality enjoy an excellent quality of life with the bustling metropolis of Barcelona just minutes away. With a population of approximately 87,000 inhabitants, Sant Cugat is dynamic and offers plenty of local amenities without suffering the overcrowding of larger cities; making houses for sale in Sant Cugat perfect for those seeking an upmarket home with a friendly, laid back medium-sized community which is great to come back to after a day in the city. The town has a young family-friendly vibe with a wide range of shops in the area and all kinds of services, including leading international schools, golf clubs and sports centres. The town is home to several large business headquarters, including international companies, and boasts a high income per capita which is reflected in the standard of living enjoyed here. All infrastructure and public parks, etc are of a high standard, clean and well maintained, creating a pleasant, safe environment to live in. Many visitors are drawn to Sant Cugat for its fantastic bohemian Vintage Market, held once a month and housed in a former ceramics factory, selling restored antique furniture, excellent food and offering live music. Whether you are looking for a detached villa or a smaller property in the town, Lucas Fox has what you need in our extensive portfolio of magnificent family homes and apartments for sale and rent. Sant Cugat was once a summer holiday retreat for the Catalan Bourgeoisie and the many Modernista period buildings found here are a testament to that bygone era. Lucas Fox offer period properties such as townhouses, villas and apartments that have maintained charming original features such as vaulted ceilings, stained glass windows and mosaic floor tiles; ideal for the discerning client that appreciates unique architectural features and is looking for a home with historic charm. 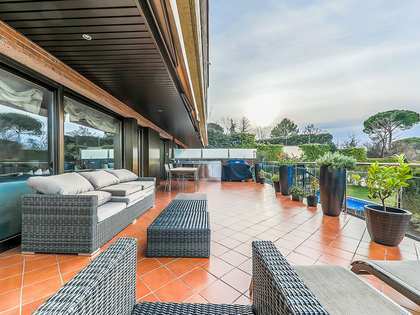 That said, Sant Cugat is also home to some stunning contemporary villas with minimalist interiors, open plan living areas, several bedrooms and bathrooms and cutting edge technology, underfloor heating and infinity pools for the ideal family lifestyle. There are also apartments and penthouse properties for sale and rent in Sant Cugat town of varying sizes and characteristics. 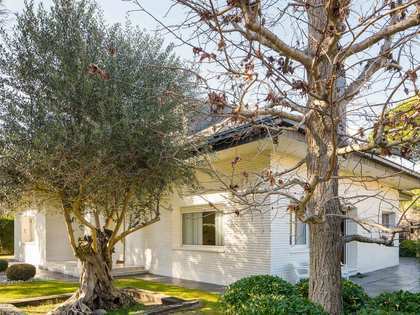 Browse through the exclusive properties on our web or contact our experienced agents to help you with your search for the ideal home in Sant Cugat del Vallés.